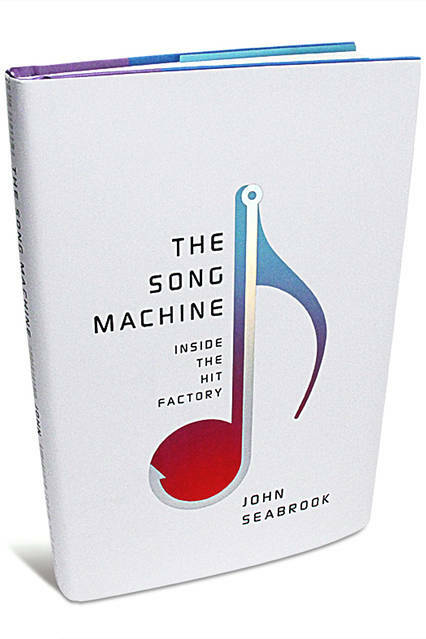 I recently read a great book by New Yorker magazine writer John Seabrook called The Song Machine: Inside the Hit Factory. It’s a fascinating, if scary, look at how the songs we hear on pop radio are constructed together these days, in an era where producers and engineers are more influential than many of the artists themselves. The concept brought to light in The Song Machine harkens back to the era of the Brill Building, in which songs would be written and handed out to artists, and sales would primarily benefit the music publishers, not the writers nor the artists. Today, thanks to technology, assembly lines of engineers produce what our ears hear: one person might work only on riffs for verses; another on the chord progressions for choruses; another singing nonsensical sounds for melody; another only doing guitar lead parts. And few of them know where their “parts” will end up because the engineers and producers “stitch” pieces together from vast computer files … creating songs from parts that were composed and recorded out of context. It’s a quilt of disconnected threads, made ear-pleasing by the mixing and splicing. And we did. A handful of us took the words and chord progressions (which the student shared) and used Soundtrap to record a version of the song, and then another friend took the audio track and created a visual companion piece. I had told the young writer via Twitter that we would be working on the song, but I never invited them into the process. This lack of direct invitation, I see now, might have been an inadvertent mistake, perhaps, as another online friend who was part of the music collaboration pointed out in a fantastic post about the uneasiness they were feeling about reworking a piece of art without the original artists involved in the collaboration. This friend wondered if we had not taken away something special from the art itself by remixing it. … it feels like we asked him for a beautiful new thing to play with, then closed the door that we’d opened. He couldn’t even watch from the window as we had fun creating some magic with his song. We closed the door and let him wait while we had a party. I don’t quite agree, but the post, as good writing does, forced me to step back and think reflectively about why I didn’t agree with this premise. I could be wrong about this, but here’s why I think our collaborative idea has merit in this digital age of composing and sharing. Unlike the system of making music in Seabrook’s The Song Factory, we musical collaborators always had a notion of what the song was and what we were doing with it. We were honoring the young songwriters. We weren’t splicing in unknown parts. We were not a factor. Their ideas became the inspiration for what we did. We were creative echoes of their art. We also were in global collaboration mode, layering in tracks together from the United States to the Netherlands and beyond, in an online space, working on the song connected by our networks. 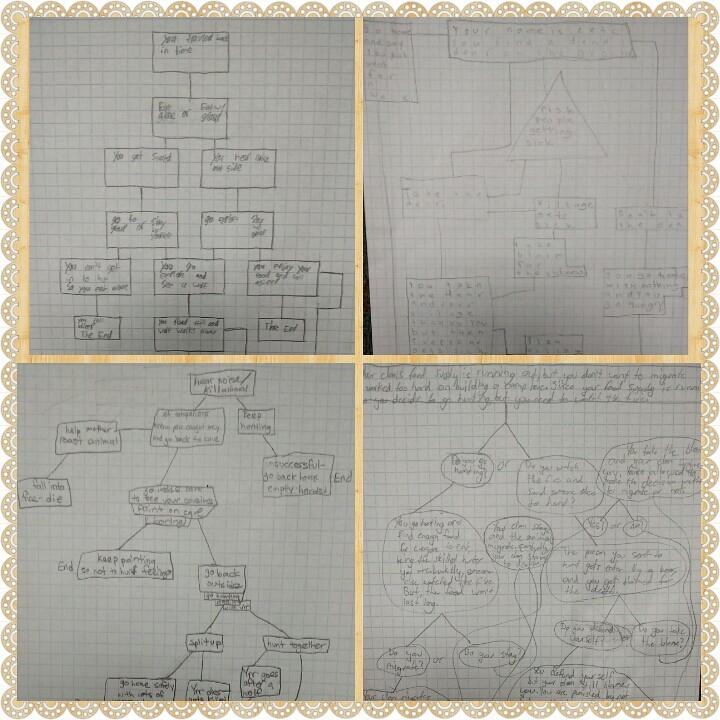 We took their Connected Learning inquiry and we used it for our own Connected Learning experience. That’s a powerful notion, for teachers to be inspired by students. We were working from the heart, and I always knew the song was theirs, not mine. Not ours. Theirs. It was, and is, and always will be, their song. I still see what we did as a gift of an appreciative audience, but I recognize my friend’s trepidation of determining where the line is between the writer and their audience. I have long argued that in the emerging field of digital writing, the line between writer and audience is thin and getting thinner, and that this shift is a good thing. I know not everyone agrees. Same here. It wasn’t that the song needs changing. It is great as it is, with the three of them singing and a single guitar. The song stands by itself. It was us, the audience, that changed, by reinterpreting the song in a gesture of appreciation. I understood the song deeper once I started to play it. Recording it brought me even further into the theme and the words of the song. It was not theft or misuse of ideas, in my opinion. It was learning. The song is theirs. It always will be theirs. It was never ours. I am happy for that. PS — Irony Alert: Swift recorded parts of her album with the same folks who are featured by Seabrook in The Song Factory. PSS — I also asked if they wanted to reverse-engineer a song of mine, to interpret it as they see fit. I followed their example, doing a simple demo on YouTube. 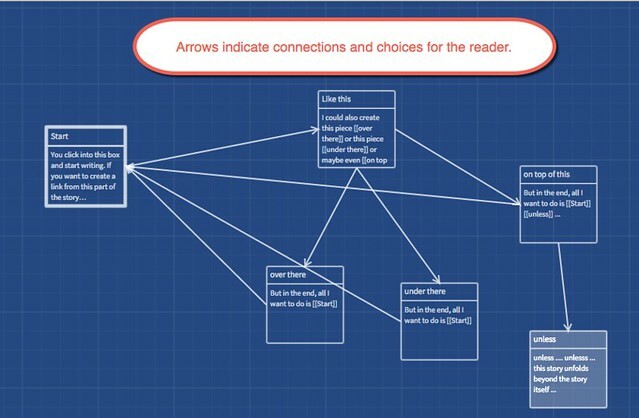 Yesterday, I shared out some screenshots on how you might use Google Slides for Interactive Fiction in the classroom, as I am currently doing with my sixth graders. Along with some of the “non-traditional writing” we are engaged with, I am also having them write more straight-forward pieces, too. 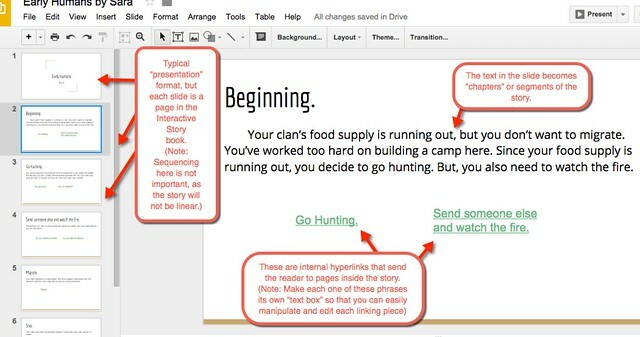 Last week, I asked them to compose an expository paragraph that walks someone through the process of creating Interactive Fiction with Google Slides. We did this offline because I still want them writing on paper, and given all of our discussions in Digital Writing Month about the continued emotional power of handwritten pieces in a digital age, I though I would share their pieces directly here. 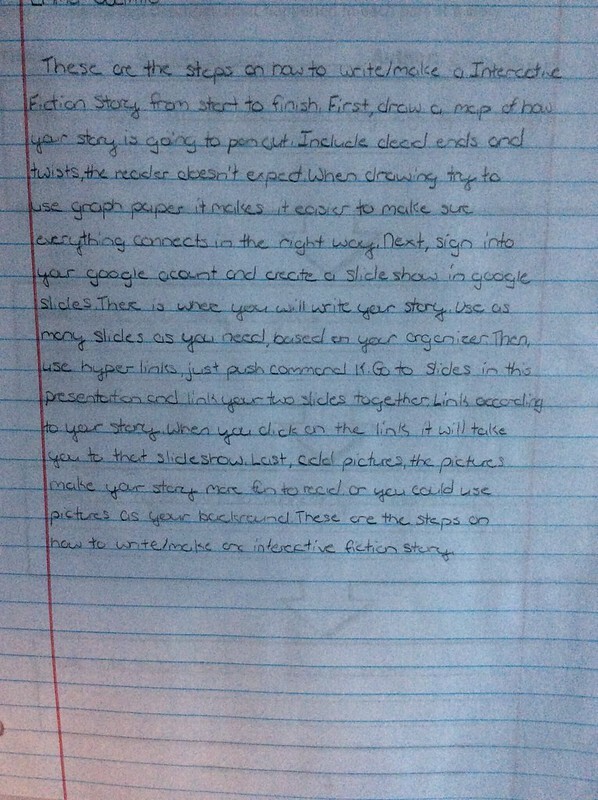 This reflective practice — of pulling back from a project and taking stock of how you are doing it — is very valuable on many levels, including for me as the teacher to know if they truly understand the processes of digital writing. I’ve been doing my best to bring elements of Digital Writing Month into my sixth grade classroom. 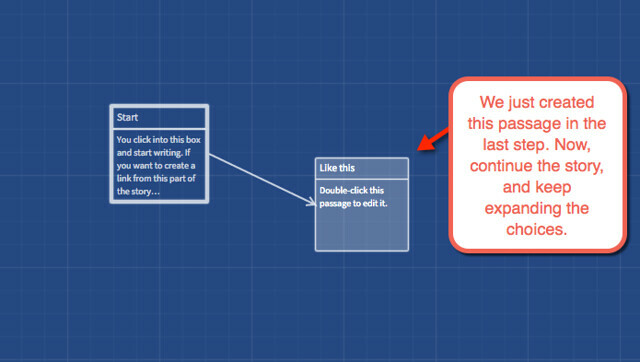 We worked on Sound Stories and with images earlier in the month, and now, during this theme of “transmedia,” I have my students working on Interactive Fiction pieces. 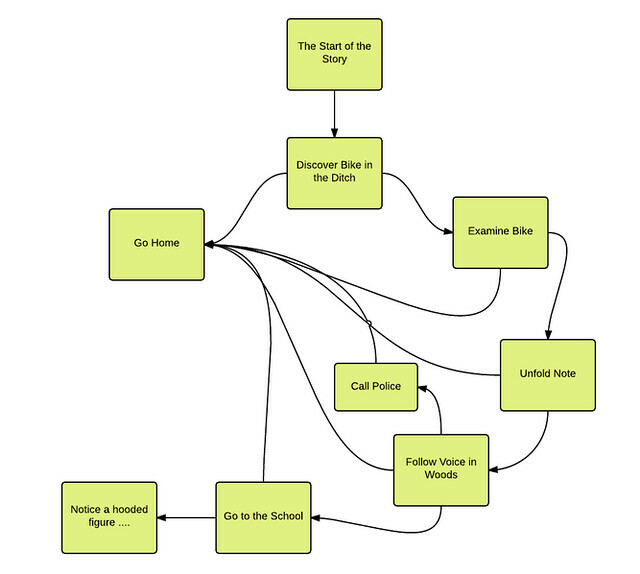 Interactive fiction is a designed story/game in which the reader is given choices to follow, and every choice branches off into another aspect of the story. 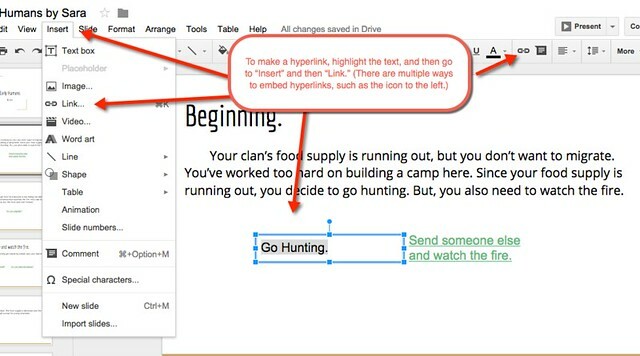 So, with my push this year around digital portfolios within Google Apps for Education, I am teaching my students how to use hyperlinks within a Google Slides project to create Interactive Fiction. 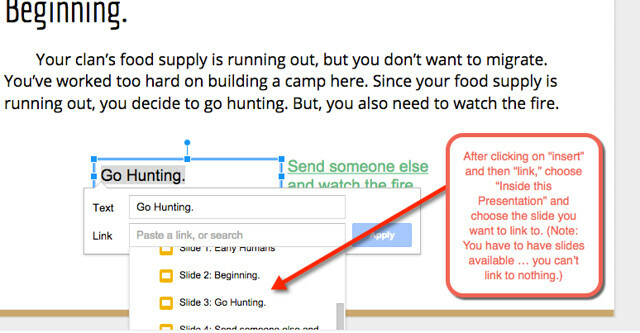 Using Google Slides for this style of writing is not perfect, but it works, and along with creating a non-traditional writing experience, it gives me a chance to teach them more about design and hyperlinks within presentation formats for the purpose of storytelling. 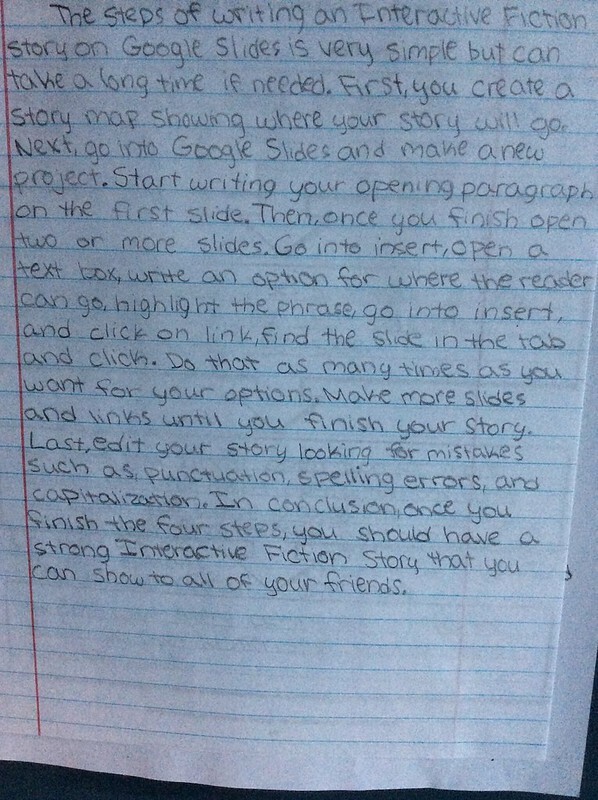 My students are writing historical interactive fiction, as I am connecting our project with work on early civilizations being done in our Social Studies class. Students are writing in second person narrative point of view, of an early human, surviving (or not) in the Ancient World, using sensory details and descriptive writing. 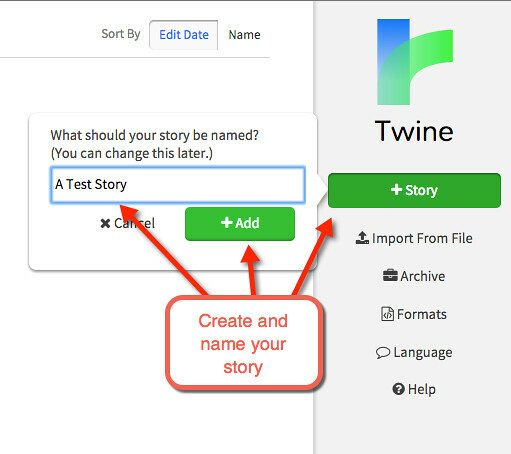 Yes, my students love this Interactive Fiction writing project, although most have never read the Make Your Own Ending stories (I have a class set that we read and talk about) and they are so deeply enmeshed in the writing experience right now. And yes, it is a very complicated writing endeavor. You have to plan for multiple story-lines in a single story experience, and let the reader “play the story,” as I have been saying each day. 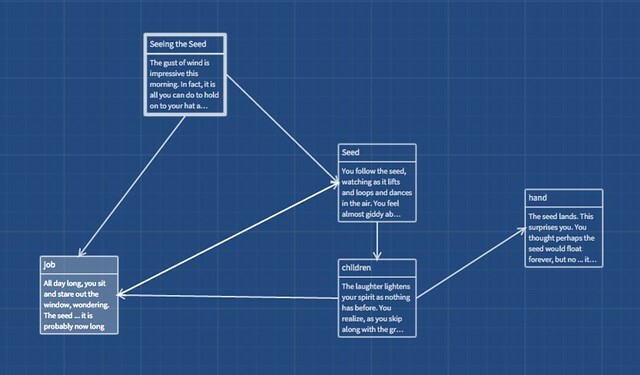 Here are a few of their “story maps” — which I require to be done before they even touch a computer. I’ll be sharing a bit over the next few days …. 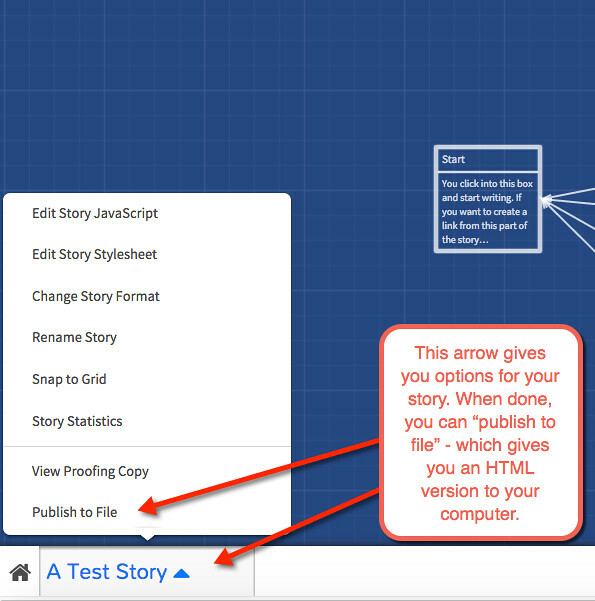 including a screenshot tutorial on how you might do similar stories in Google Slides. 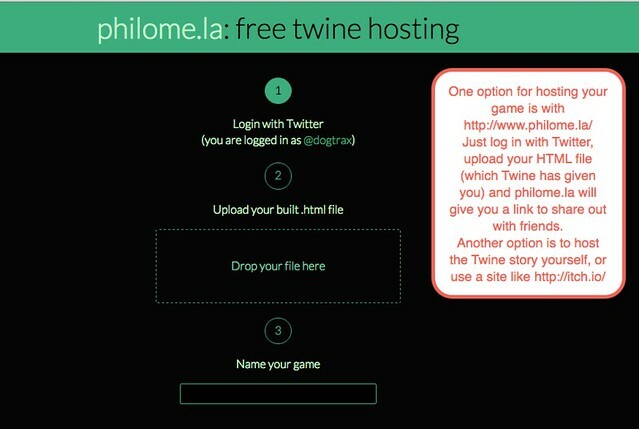 If you want a taste of what I am talking about, this is an Interactive Fiction piece that I wrote last year as a mentor text for my students (designed more as a mystery story, not historical fiction, which is what we are doing this year). 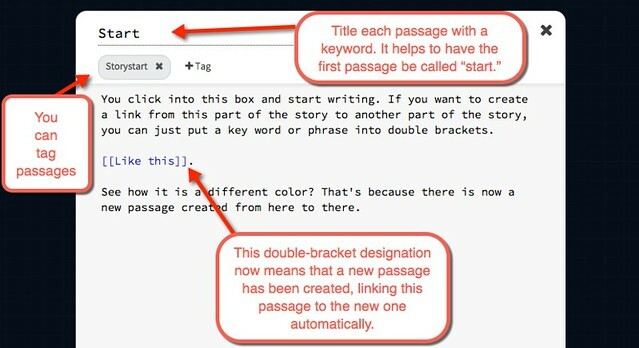 This is the kind of thing that I hope for in a community/network/gathering such as Digital Writing Month: Connections. We’re exploring ways that technology connects our writing and pushes it further into different directions. But in the end, it is not the technology; it is the people making the writing happen that is heart of Digital Writing Month. 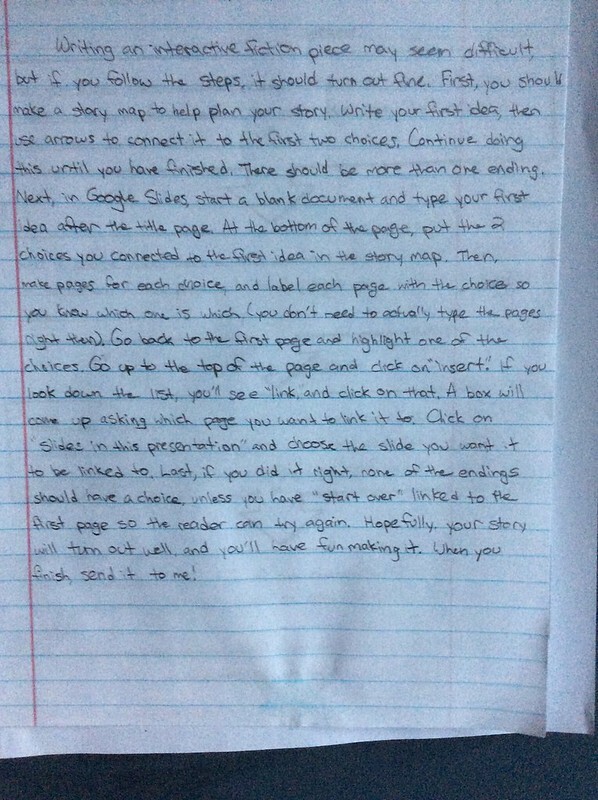 First, Simon wrote a post for Digital Writing Month and Angela wrote a comment. Then, Tanya read the post and comment, and was struck by Angela’s ideas. Tanya then goes and records an audio response to Angela’s comment, using Soundcloud. She wants to give voice to the conversation. Angela hears Tanya, and responds with her own audio track. The theme begins to center around voice and introversion and social media spaces. I listen to both of their responses now, and I am struck by the message and the power of their voices. I decide to listen to them again as I write a poem, using phrases from their audio tracks as inspiration for my writing. I record on Soundcloud. Ron listens in, and takes my track and adds a layer of music to it. He adds silence and pauses. He composes with the voice. He shares out, too. Now, we hope that Terry might take Ron’s track and move the audio into digital storytelling form with Terry’s private Z33ga experiment. 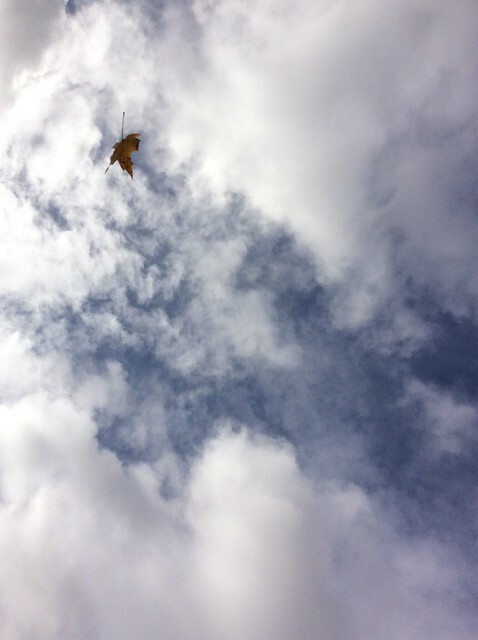 And so it goes …. We talk across the wires …. Yesterday, I shared out a transmedia piece that I created. I don’t know how many people tried it out. I do know that there plenty of places where the technology might have fallen apart. First and foremost, some of the sites and tricks I used worked only on computers, not mobile. That limitation is a big deal. I am also trying to make visible my ideas around this term: transmedia. I am no expert. I am exploring, though, and so in the aim of showing what I was thinking and planning for my story, I figured it would be helpful to pull back the covers a bit. Here, then, is overview of the entire project. 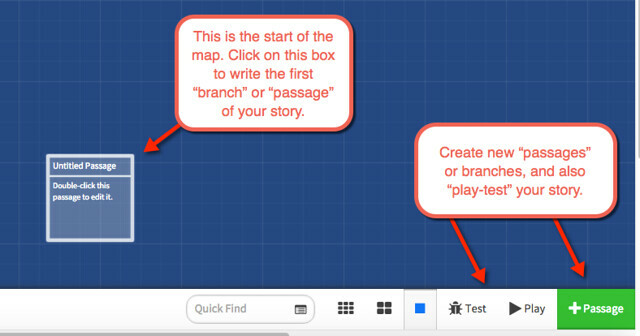 I’ve used Thinglink to annotate my story map with links to the pieces. So feel free to bounce around. Unlike yesterday, when you were traveling blind among the caves of my imagination (which was the idea behind the construction), here I am providing you with a flashlight. I’ve love to know how you experience it. The final link is an interactive wall, for you to leave me thoughts and comments and complaints. Thanks for being explorers in this cave I built. Now, go spelunking into the story! 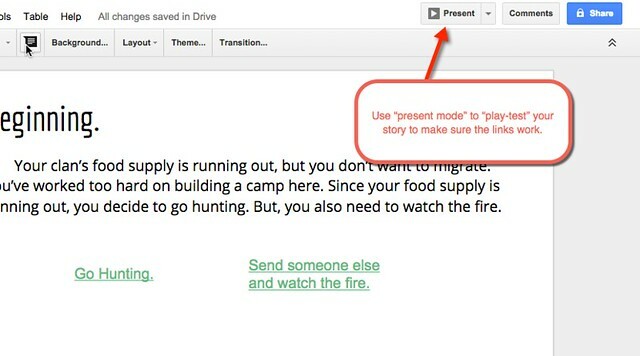 I love the element of collaboration that digital writing spaces bring to the forefront. Soundtrap is yet another, and one I have used before, but essentially, it is a Garageband-like loop music site that allows for collaborative recording and mixing of songs. Last week, after the horrible attacks in Paris, I was searching for some way to connect with my many friends in the Digital Writing Month community. Something that would bring us together and signal the need for peace in the world. Something reflective and collaborative. It would be a small gesture, perhaps, but change begins with small gestures. So, I went into my guitar case (it’s my unofficial filing cabinet of lyrics) and pulled out an old song called Peace Garden. The backstory to this particular song is that I wrote it in the aftermath of a terrible event in our small city, where one high school student stabbed another high school student on the streets of our city after an argument. The victim died. It was horrible and shocking, and when the high school where both attacker and victim were students created a Peace Garden to remember their classmate and to promote peaceful resolution to conflict, a small musical group I was in (The Millenium Bugs) was invited to attend and perform a song or two. I wrote Peace Garden for that event. This past week, I pulled it out again, dusting it off, and recorded a version in Soundtrap and then, I put out the call to others to join me in adding layers to the song. And they did. They did. I had Ron, and Alan, and Bryan, and Sarah, and Maha, and a few others popped in, too. Some left sounds. Some just listened and tweaked the mix. Some are still adding to it. I’m happy for the collaboration, and satisfied that this kind of activity brings my own world, at least, a little closer on the theme of peace. May we all plant flowers in the ground and join together in making the world a better place today, tomorrow, forever.